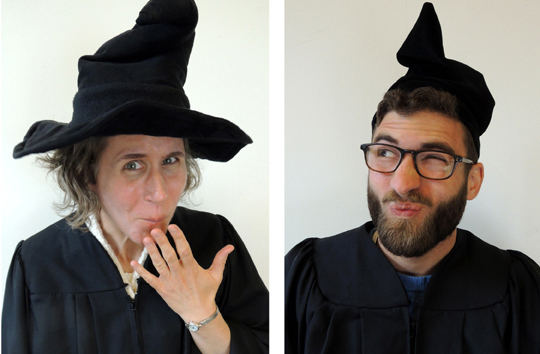 Harry Potter is celebrating a birthday shortly, which is the only excuse we need to bust out our hats and robes and do something Potter. You might recall our Wand Works event, which included some awesome Flourish & Blotts giveaways. 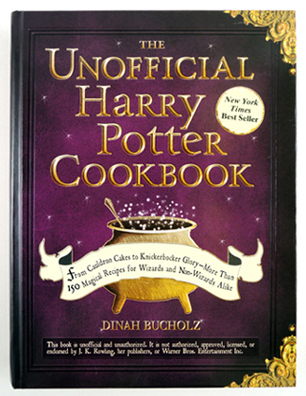 Well, when Katie and I were researching said giveaways, we stumbled across The Unofficial Harry Potter Cookbook by Dinah Bucholz (Adams Media, 2010). Today, we’re going to test a couple recipes from the book. And post reaction shots. In wizard robes. The cookbook contains 10 chapters and 150 recipes. While a traditional cookbook organizes its recipes under chapters like main dishes, salads, and sides, the Unofficial Potter has chapters like “Recipes from a Giant and an Elf” (Rock Cakes, Bath Buns, Treacle Fudge, Kreacher’s French Onion Soup, etc.) and “Good Food with Bad Relatives” (Lemon Pops, Knickerbocker Glory, Roast Pork Loin, Mulligatawny Soup, etc.). The Unofficial Potter is also an interesting education in British cuisine, as recipes for crumpets, kippers, and black pudding are included, among other things. Each recipe in the cookbook is matched to a Harry Potter reference and there are also very interesting bits of culinary history. For example, did you know the first ice cream recipe came to England in the 1600s and King Charles the I swore his cook to secrecy because he wanted to keep the delicious dessert exclusive to royalty? Such a scallywag. The recipe for Hagrid’s infamous rock cakes was one of the first I spotted in The Unofficial Harry Potter Cookbook. I couldn’t wait to give it a go and see if they are as delicious as Hagrid claims because we all know he eats them throughout the Harry Potter series. 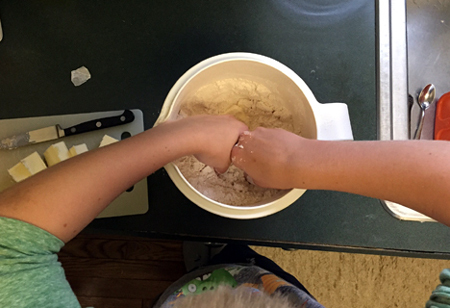 My sous-chef son had been eager to get back into the kitchen with me after our failed attempt at making Monsieur Bon-Bon’s Top Secret “Fooj.” We’ve baked many times together, so we were confident we wouldn’t mess up this recipe! My sous-chef carefully measured and combined all of the dry ingredients (flour, sugar, baking powder, cinnamon and salt) into a mixing bowl while I prepared the cookie sheet and turned on the oven. After we washed our hands several times, we dove into mixing the butter into the dry ingredients. 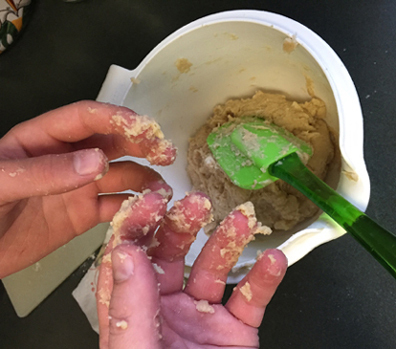 It didn’t take long before the use of our fingertips turned into the use of our full fingers (and some of our hands) in order to make sure we fully incorporated the butter into the dry ingredients. After folding the egg and milk into butter mixture, we slowly mixed in the raisins. This was the only time we both grew concerned about the rock cakes. The batter seemed really thick and tough to mix. After a short while, my son didn’t have the strength to fold in the raisins so he passed the spoon over to me. Even I had a hard time making sure the raisins were fully mixed in! Once we both determined the raisins were well combined, we dropped the dough onto the cookie sheet. We skipped using a tablespoon to measure the dough size and just eye-balled the amounts. There was a small amount of batter leftover that my son used for his own personal “teeny tiny” rock cake. We slid the cookie sheet into the oven for 25 minutes, turning the sheet once in the middle of the baking cycle. Once the rock cakes were lightly brown on the bottom, we pulled them out and set them on racks to cool. The next morning, Dr. Dana and Marissa’s office test confirmed…the recipe is a winner! Rock cakes have the appearance and consistency of a scone, so they would be perfect as a morning treat with a cup of coffee or eaten in the afternoon with a spot of tea. 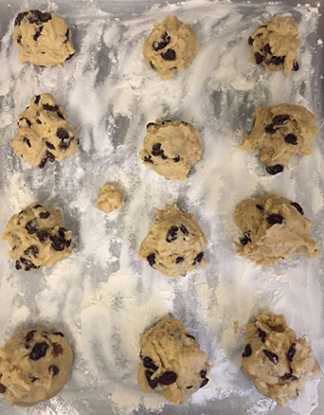 My son and I brainstormed other filling options to use in place of raisins and we came up with dried fruits, such as cranberries, cherries or blueberries, chocolate chips, or perhaps just including a splash of vanilla extract to the dough. You could also skip adding anything and eat plain rock cakes with a pat of butter and glob of your favorite jam or jelly. 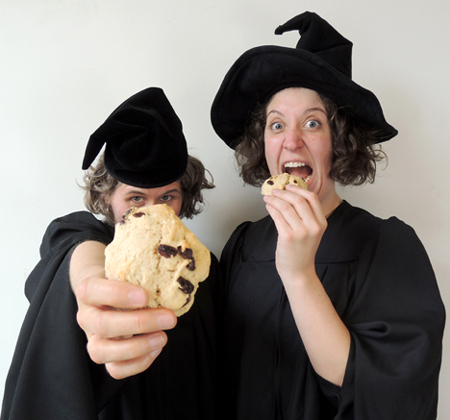 In honor of Hagrid, Dr. Dana and I set one rock cake aside and let it harden for over a week to see what would happen. It was hard, though not as hard as a rock because Ian was able to take a bite and not break a tooth. I deem the rock cakes recipe worthy of trying in your kitchen! Confident from our success with the rock cakes, my sous-chef and I moved onto another intriguing recipe: acid drops. Poor Ron Weasley had a hole burned in his tongue when his mischievous brother, Fred, gave him one to try. What would happen to us? 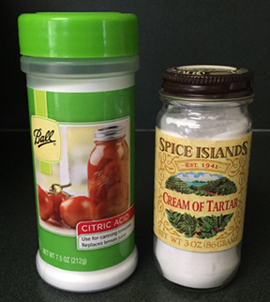 I had most of the necessary ingredients already, but I did have to hunt down cream of tartar, which I discovered in the spice aisle, and citric acid, which was kept with the accessories needed for home canning. As I lined two baking sheets with parchment paper, my son measured and combined the water, sugar, and cream of tartar in a small pot. He asked for help with the corn syrup as it looked to him to be hard to measure correctly. I happily obliged to avoid a sticky syrupy mess. We followed the directions carefully, stirred the mixture constantly and used a candy thermometer once our concoction was bubbling. 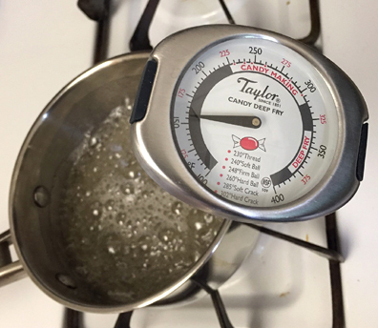 We watched the candy thermometer slowly rise in temperature, stirring every once in a while. All was going well until the mixture reached a temperature of about 250 degrees Fahrenheit. That’s when I noticed our whitish clear blend suddenly started turning brown. There was also a distinguishable burning smell being emitted from the pot. I knew this was not good, but we decided to follow through until the mixture was at 300 degrees Fahrenheit, per the recipe. 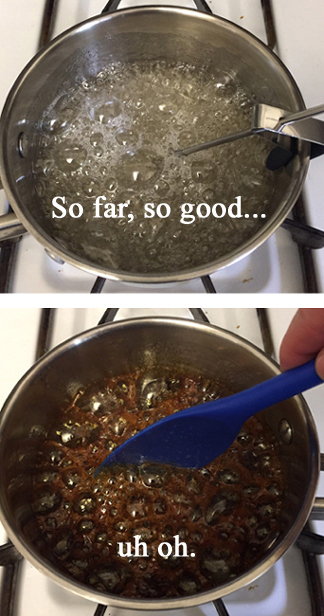 Once it hit that temperature, I turned off the burner and we added the citric acid. 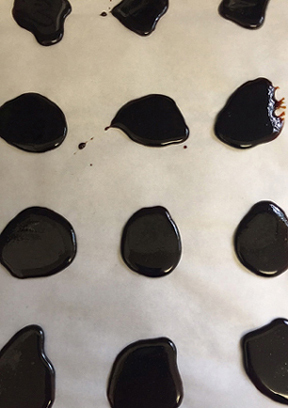 As soon as the mixture had cooled and stopped bubbling, we took turns dropping teaspoon sized circles of the candy onto the baking sheets. Total fail. Acid drops are supposed to be yellow or yellowish-white, not dark brown almost black. The smell of the candies also reaffirmed what I already knew: the sugar had scorched and the candies were a bust. 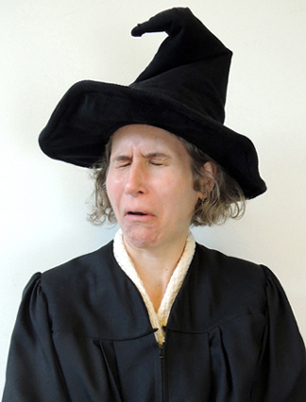 On a dare, Dr. Dana tried one of the burned candies. I think this image says it all. Attempt #2. I consulted Google to find suggestions or ideas from others who have suffered similar fates with their candy. Apparently sugar is very easy to burn, so you have to be cautious when your mixture starts getting close to reaching 300 degrees Fahrenheit. Armed with this new information, I set forth to try again. I think I may have pulled the mixture off the burner too soon because it didn’t harden into candy. 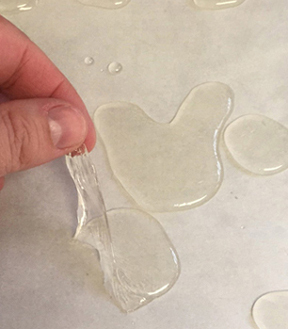 It was congealed and looked like white, stringy amoebas when I dropped it onto the baking sheets. Not wanting to give up, I tried the recipe for a third time. Did I finally find success? Maybe. 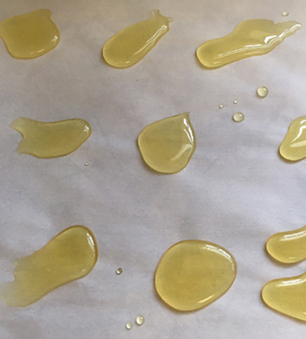 My takeaway from trying to make acid drops is that I’m a baker, not a candy maker. I offer a round of applause to those who can make candy because, alas, it is proven that I cannot. I’ll officially hang up my candy maker hat and leave the job to Honeydukes. My sous-chef son was thrilled when we found the lemon pops recipe in The Unofficial Harry Potter Cookbook because he has a wicked sweet tooth (like his mother) and he absolutely loves anything with lemons. He’s been known to steal lemon slices from my water glass and eat them raw without making a funny sour face. The only ingredient that I didn’t already have in my kitchen for the lemon pops was lemon extract, which I found in the spice aisle at our local grocery store. 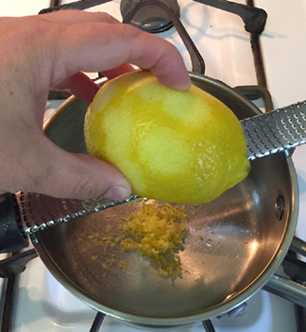 I took care grating the zest of our lemon directly into the saucepan, making sure to not add any of the white rind because that could cause the lemon pops to have a bitter taste. My sous-chef squeezed the juice out of the zested lemon using our handy lemon/lime press, and then he added the sugar and water to the pan. After bringing the mixture to a simmer, we turned off the heat and added the lemon extract. 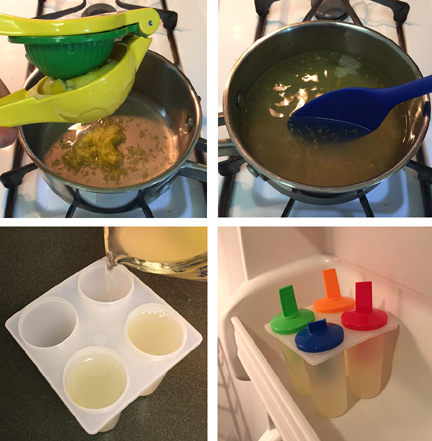 We let the mixture cool down a bit before pouring it into our popsicle molds, then we placed the molds into the freezer. Many hours later, we gave the lemon pops a taste. Delicious! The combination of the lemon zest, juice and extract along with the added sugar gave the lemon pops a nice sweet and sour flavor that almost tasted like limoncello liquor. But trust me when I say that these popsicles were absolutely alcohol free. Two hardy thumbs up for the Triple Power Icy Lemon Pops! 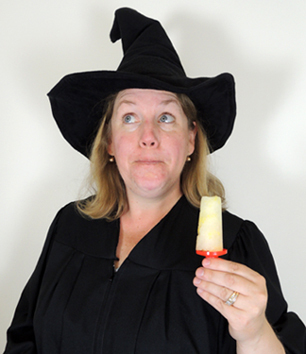 We agree with Harry Potter, these popsicles are quite good! I tested something chocolate. Are you shocked? 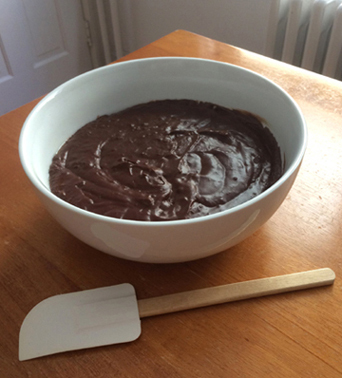 Specifically, I tested the chocolate pudding recipe in the chapter entitled “Delights Down the Alley.” We have food allergies in my house – including eggs – so pudding is usually off-limits. I was thrilled that, unlike most pudding recipes, this one was eggless! 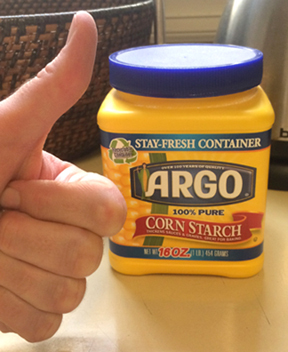 The binding agent is cornstarch. I won’t send you process photos because Katie’s stove is way cleaner than mine. But I will say that this recipe is straightforward, easy, and can be made in a single pot. The ingredients are sugar, unsweetened cocoa, cornstarch, milk, cream, butter, bittersweet chocolate, vanilla, and a pinch of salt. Though simple, there is a bit of cooking magic involved in the final stove top stage – the recipe transfigures from a chocolate liquid to a thick, velvety pudding. Mmmmm. The recipe says to strain the pudding into a bowl (I’m guessing to catch some of the inevitable lumps). But I don’t have a strainer, so I skipped that step. The pudding was a tad lumpy, but not enough to bother me or my extraordinarily picky children. Here’s a shot of the pudding before it headed into the fridge to set. Note the magic wand in front of the bowl. 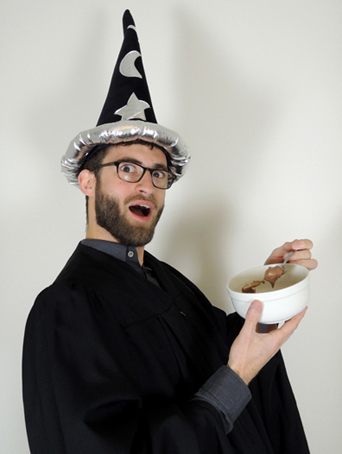 How does the Unofficial Potter pudding taste? Awesome. The milk, cream, and butter in the recipe make it rich, but not too heavy. The consistency is great too. Very smooth and creamy. Ian had a taste and found the chocolate pudding to be quite…bedazzling. 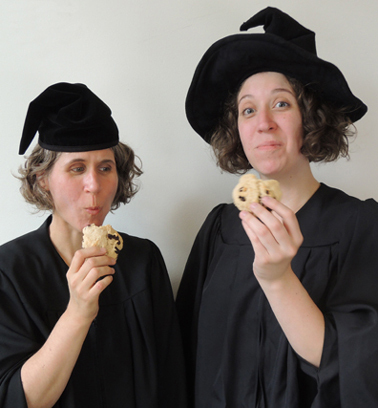 We only scratched the surface of the Unofficial Harry Potter Cookbook, but we really liked it! It’s a fantastic blend of British dishes, culinary history, and astute references to the dishes and desserts served in the Harry Potter books. It’s clear the author is either a fan of the books, a very good researcher, or both! If you are a Harry Potter fan who likes to cook, or if you are ready for some hands-on experience with meals in the wizarding world, add this book to your collection! This entry was posted in Tools, Tips & Testing and tagged acid drops, book, chocolate pudding, cookbook, Dinah Bucholz, eggless pudding, Flourish & Blotts, Hagrid, harry potter, how to, instructions, kids, kitchen, lemon pops, library, literacy, Rock Cakes, test, The Unofficial Harry Potter Cookbook, tip, tips, tools, triple power icy lemon pops, wizard by Dana Sheridan. Bookmark the permalink.